The VeriFone Omni 3730LE Credit Card Terminal is user friendly for both merchants and customers. With a full range of payment capabilities and an easy-to-use integrated printer, the VeriFone Omni 3730 LE comes at a great value. 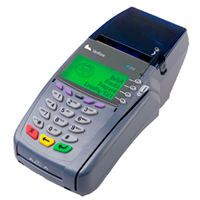 The Omni 3730LE is a reliable payment terminal with a full range of payment capabilities. The 3730LE makes quick work of debit, credit, and check authorization transactions and has an ATM-style interface, which requires virtually no training and reduces costly user errors. It also has an integrated thermal printer with trouble-free, drop-in paper loading. Part of the proven Omni Solutions family, the Omni 3730LE is a hard-working, reliable payment terminal that will earn its keep, day after day. Need a full range of payment capabilities? The Omni 3730LE makes quick work of debit and credit transactions. Want a terminal that requires virtually no training and reduces costly errors? The Omni 3730LE has an ATM-style interface that’s instantly intuitive for even your newest hires. Need more? The integrated thermal printer – with trouble-free, drop-in paper loading – and a built-in PIN pad keeps your countertops clutter-free. Plus, the lightweight, ergonomic device can be easily handed to customers for PIN entry. One more thing – the VeriFone name means that your terminals will continue delivering unsurpassed value for years. It’s good to know that no matter how your business grows or changes, you can count on the payment leader: VeriFone. Compact footprint saves counter space – lightweight device can be easily handed to customers for PIN entry. Quiet, integrated thermal printer features “clam shell” design for drop-in paper-loading. Vertical, triple-track card reader improves read rates and accommodates all magnetic-stripe cards, including drivers’ licenses. Latest security features include advanced 3DES encryption, Master Key/Session Key and Derived Unique Key Per Transaction (DUKPT) key management, and sophisticated VeriShield file authentication and tamper resistance – plus it’s PED approved by Visa and MasterCard for PIN-based transactions. VeriFone’s unsurpassed quality and reliability means trouble-free usage for years.